In the spring of 1991 while working in my studio, I took a little bible that was recently given to me and started reading to see what this little book was about. The passages I read felt like scriptures written to redefine human's consciousness, I felt acquainted with them because this is how I have always lived my life. As I flipped through the pages I came upon the chapter about the apocalypse and found this passage, Behold, he comes with the clouds, and every eye shall see him, and all the tribes of the earth shall wail over him. Even so. Amen. "I am the Alpha and the Omega, the beginning and the end", says the lord God, "who is coming, the Almighty." From there I stopped and tried to figure it out. I put the little bible back on the table, but could not stop thinking about it. About a week or two later I had a dream that scared the living life out of me to the point the following night I stayed awake all night. I knew this was a message and I had to paint it, and that only the President of the United State should see and have the painting. "The End The Beginning". That is the inspiration that drove me to paint it in the summer of 1991. The painting was signed in 1993 before an exhibition in downtown Manhattan. I am taking this opportunity to thank President Clinton for welcoming the painting into the White House in 1994. This painting represents my observations about the state of turmoil particularly political turmoil that exists in the world. I felt a compelling need to express these feelings in my work, using universal political symbols to contrast the way things should be with the way they are. 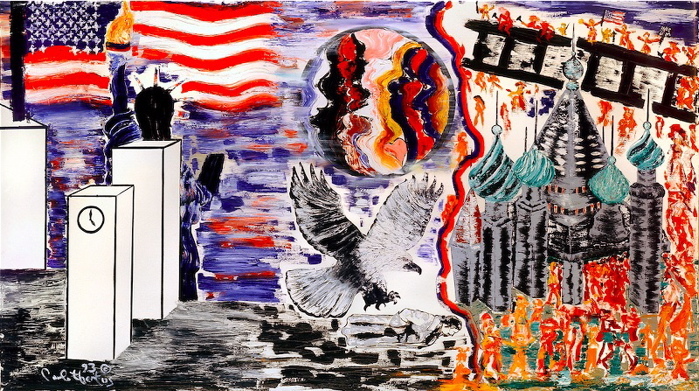 As we look at the painting The End / The Beginning we see the Kremlin depicted on the lower right hand corner with people outside its walls in a state of extrieme chaos. Above, is the Berlin Wall being torn down as the people desperately attempt to gain their freedom. On the far left of the painting is America, a universal symol of freedom. The American flag, the Statue of Liberty, skyscrapers....all represent freedom as a philosophical ideal and America as a model for contemporary living. The clock reminds us of time which is running out and of the need to take action before it is too late. In the center dominating the canvas is the world which seems to look over the events taking place quietly mourning this state of affairs. Below is another symbol of liberty,the Eagle, whose outstretched claws reach to attack Lenin lying prone in defeat. All humans are destined to be free. Freedom forever.